The Star Wars Story Comes Home: Rogue One Blu-ray, DVD and Digital HD Details! 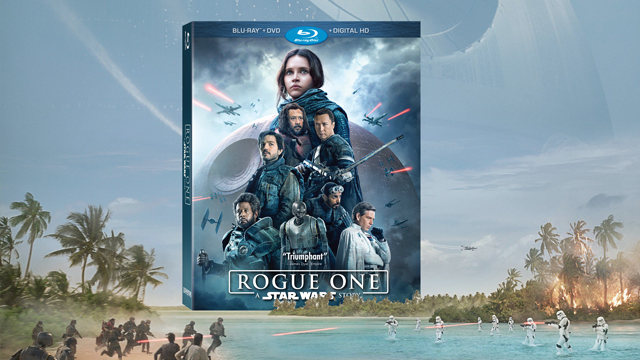 Walt Disney Pictures and Lucasfilm announces Rogue One Blu-ray, DVD and Digital HD releases! Walt Disney Pictures and Lucasfilm have today announced that Rogue One: A Star Wars Story, the first of the Star Wars standalone films, will come home starting next month. Look for the film to hit Digital HD and Disney Movies Anywhere on March 24. Fans can then catch the Rogue One Blu-ray Combo Pack, DVD and On Demand release on April 4. You can check out a trailer for the Rogue One Blu-ray in the player below and find the cover art for both the Rogue One Blu-ray and DVD as well as retailer exclusive packaging designs in the gallery viewer at the bottom of this page! Never-before-seen Rogue One bonus material will take fans behind the scenes with the movie’s diverse, dynamic cast and inspired team of filmmakers. An intimate collection of stories reveals how the film came to life, as well as hidden Easter Eggs and film facts that audiences may have missed in the theater. – A Rogue Idea – Hear how ILM’s John Knoll came up with the movie’s concept – and why it’s the right film to launch the Star Wars stand-alone films. – Cassian: The Spy – Diego Luna shares insights into his complex, driven character, who becomes a hero through selflessness, perseverance and passion. – K-2SO: The Droid – Explore the development of this reprogrammed Imperial droid, from initial pitch and character design through Alan Tudyk’s performance. – Baze & Chirrut: Guardians of the Whills – Go deeper into the relationship between these two very different characters, with Chinese superstars Jiang Wen and Donnie Yen. – Bodhi & Saw: The Pilot & The Revolutionary – Forest Whitaker and Riz Ahmed reflect on Saw Gerrera, the broken Rebel leader, and Bodhi Rook, the Imperial pilot who defects. – Visions of Hope: The Look of Rogue One – The filmmakers describe the challenges and thrills of developing a bold new look for the movie that can fit within the world of the original trilogy. – The Princess & The Governor – See what it took to bring the vibrant young princess of “Star Wars: A New Hope” – as well as one of her most memorable foes — back to the screen. – Epilogue: The Story Continues – Filmmakers and cast celebrate Rogue One’s premiere and look forward into the future, to the Star Wars stories yet to be told. – Rogue Connections – Uncover Easter eggs and film facts hidden throughout the movie that connect “Rogue One” to the Star Wars universe. Per StarWars.com, the Rogue One Blu-ray will arrive with a number of retailer exclusives. Target‘s five disc set will include collectible packaging with interchangeable character covers and exclusive bonus content (Blu-ray 3D + two Blu-ray + DVD + DVD exclusive content – 2 additional bonus features + Digital HD + collectible packaging). Best Buy will offer a four disc set with exclusive SteelBook packaging (Blu-ray 3D + two Blu-ray + DVD + Digital HD + SteelBook packaging). Finally, Walmart will deliver a three disc set with exclusive K-2SO packaging and two Galactic Connexions trading discs (two Blu-ray + DVD + Digital HD + K-2SO packaging + two Galactic Connexions trading discs). Are you planning to pick up the Rogue One Blu-ray, DVD or Digital HD release? Which version will you get? Let us know your thoughts in the comments below!